. :: ESTANCIA VIK JOSÉ IGNACIO EXCLUSIVE POLO PROGRAM ::. Estancia Vik Jose Ignacio, Uruguay’s most exciting new private retreat and haven of art, nature and design is delighted to announce ‘Polo at Estancia Vik’ which will grant guests exclusive access to the property’s private polo field and stable. Estancia Vik Jose Ignacio’s professional private polo field is one of the most spectacular in South America, featuring stunning panoramic views across the lagoon and out towards the Atlantic Ocean. The spectacular setting, which is described as a meeting of Marlboro Country and a virgin San Tropez has already attracted some of the world’s most accomplished polo players, including Adolfo Cambiaso, Jr., Bartolomé Castagnola and Marcos Heguy. Beginning this spring, Estancia Vik Jose Ignacio will offer an array of unparalled polo experiences including a wide range of activities for the novice, the professional, and the polo aficionados alike. Polo Lessons: Guests of Estancia Vik have the opportunity to enrol in polo lessons from the Estancia Vik Polo Club for every level of player, from beginner to professional. Individual as well as group lessons are available from professional trainers, granting guests incredible access to one of the best polo fields in the world. Individual and group polo lessons start from $150 per hour and the Club offers a three-hour intensive training Polo Clinic for $250. Polo players can also reserve the field for their personal use starting from $100 per hour. Vik signature polo mallet: Upon departure each guest will receive a polo mallet embossed with the Vik crest, providing guests with the opportunity to have their own mallet for use around the world, or when they return for another stay at Estancia Vik. America’s premier polo matches, including annual polo event Art Vik Terramar. Vik Polo matches are the social events of the season and have attracted South American locals and glitterati alike, including founder of Tom’s Shoes Blake Mycoskie. Aligning with the art aesthetic of Estancia Vik, at this year’s inaugural Art Vik Terramar, a selection of artists and designers featured at the property created polo helmets to auction, with proceeds benefitting local Uruguayan schools. 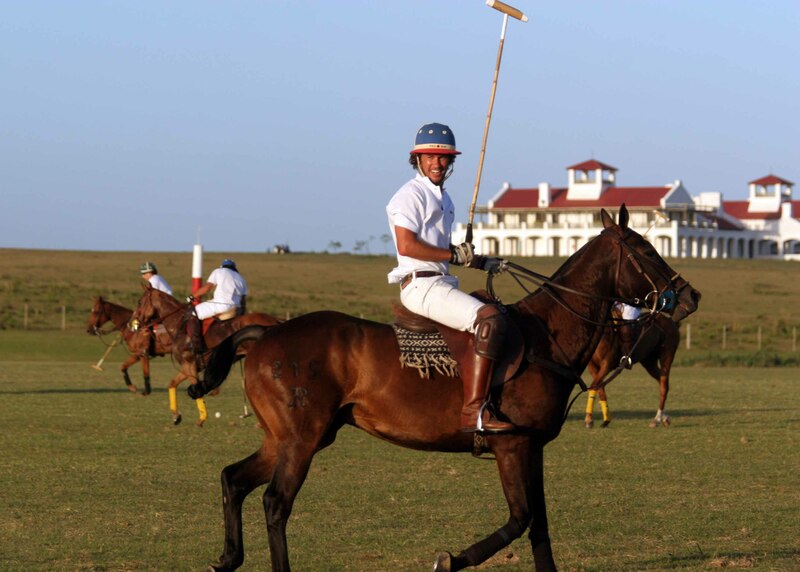 Polo Clinics: Estancia Vik Jose Ignacio is also pleased to offer special polo packages for its guests. Polo groups and teams can enjoy the luxurious amenities and personalised service of Estancia Vik with a world-class polo field at their fingertips. Groups have the opportunity to reserve a stay in the Estancia’s remarkable suites, or the entire property, with the Estancia’s Polo Package, including: a six night stay at Uruguay’s most luxurious private retreat accompanied by two daily polo lessons, a bespoke Estancia Vik mallet and ball and gourmet meals customized to one’s tastes, and more. Estancia Vik José Ignacio, which opened to international acclaim in February 2009, merges exceptional design, incomparable location and natural setting, flawless personalised service, environmentally minded practices and an unparalleled collection of contemporary Uruguayan and international art. Situated on 4,000 acres, Estancia Vik is a traditional Spanish colonial structure featuring white adobe walls and a red tin roof designed by Uruguayan architect Marcelo Daglio. The structure is 50,000 square feet, with more than half of that space made up of interior patios of outdoor space –courtyards, gardens, covered walkways and an herb garden located within the Estancia walls. Located just 20 kilometres, or 12 miles, northeast of Punta del Este, José Ignacio is emerging as South America’s most coveted international destination.